Det var et held jeg bladrede de medfølgende brochurer med for indeni var gemt mit society lifetime membership-kort. Jeg har ikke fået tilbudt denne af Springbank Society....hvilket er lidt mærkeligt, da jeg er medlem og før har købt deres flasker. Er der blevet tilbudt andre end denne aftapning det sidste halve år, og er der nogen gode råd til hvordan man kan bestille en flaske af denne her nævnte aftapning? Medlemmer af Springbank Society modtog denne mail den 8. april. Greetings to everyone from sunny (for today anyway) Springbank! It's been a very wet winter here in Scotland but now that summer is on the way we're hopeful that it's going to be a good one. Despite the weather, we've been very busy at the distillery over the last few months. We've been organising new Longrow bottlings, new Lifetime Members of the Springbank Society, the Springbank Whisky School 2008 and last but not least a new Society bottle! At long last we are able to announce the details of the latest Society bottle - a 17 year old Springbank matured in port wood. Stuart Robertson has managed to come up with 570 bottles at cask strength, 51.5 per cent. The bottle is, as always, only available to you, the Society members, and can only be ordered directly from us. On this occasion, the bottle will NOT be available to order through the www.springbankwhisky.com website. Instead, we would ask that you email us at society@springbankwhisky.com or telephone the Cadenhead's Campbeltown Whisky Shop on +44 (0) 1586 551710 to place your order. Orders are limited to one bottle per member so that all members will be able to get a bottle. If you are ordering by email, remember that you'll need to send us your credit card details, including the long card number, the expiry date and the last three digits of the CVV code on the back of the card. We will also be checking all orders against our newly-updated database to make sure that the bottles are only sold to members. The bottles are priced at £55 each and are available from today. Nose: Sweet and treacley with a prominent port wine influence. Palate: Thick, leathery and a hint of wood. Oily and salty on the tongue. Unmistakably Springbank. Finish: Subtle smoke, long and creamy. The port wood influence gives this whisky an added dimension to savour. Jeg har ej heller modtaget noget nyhedsbrev omkring denne gang. I er ikke de eneste der ikke har modtaget nyhedsbrevet og lifetime membership. I følge Springbank "The Society is currently closed to new members but will be re-opening within the next few weeks. The fee will be a one-off payment of £50 for a Lifetime Membership and you will be able to join through this website." Medio februar udsendte Springbank Society et rigtigt brev til medlemmerne (med kuvert, frimærke, m.m.) hvor man blev bedt om at meddele om man var interesseret i gratis Lifetime Membership, som tak for venlig deltagelse hidtil. Hvis man ikke har reageret på denne henvendelse, er det tænkeligt at man er blevet slettet af medlemslisten. Alle som har reageret og som har bestilt en flaske Springbank 17 Port Wood vil modtage medlemskort sammen med flasken, som Lars omtaler tidligere i denne tråd. Jeg har heller ikke fået, hverken det rigtige brev eller seneste mail, og det er vel lidt underligt i betragning af, at mailen om ledige pladser på deres whisky skole er nået frem til min mailboks. Jeg kan også stadig logge ind på sociaty siden. jones wrote: Medio februar udsendte Springbank Society et rigtigt brev til medlemmerne (med kuvert, frimærke, m.m.) hvor man blev bedt om at meddele om man var interesseret i gratis Lifetime Membership, som tak for venlig deltagelse hidtil. Jeg har ej heller modtaget noget snail-mail midt i februar, men jeg har dog - ligesom Bjærre modtaget mail om whiskyskole og kan også stadig logge ind som society member. Some of you may already know that we have a new member of staff working at the Society to help with all of the administration that is involved. Janet Blair has been working in the office at Springbank since March last year and is now spending three days each week helping to run the Society. Janet has already had a great input into the Lifetime Memberships and will be invaluable in improving the service that we offer to our members. Jeg har intet modtaget, hverken mail eller brev. Men når det drejer sig om Longrow 18yo eller samples af Glengyle er der intet problem. Har fået 5 forskellige samples. Når jeg ringer eller mailer får jeg at vide de har sendt brev og mail til mig. Jeg har bedt om at de skulle sende det igen, men intet er sket. Jeg meldte mig ind i Springbank Society den 11 uni 2003. eg var blandt de 10 første betalende medlemmer. Blev medlem et par dage før Jones, som har modtaget det hele. De har vist ikke styr på det hele!! Tak til jer alle for jeres bidrag til opklaringen. Nu vil jeg så forsøge at afsende en mail og bestille en flaske. Glæden bliver stor når den kommer i hus! Siden der tilsyneladende er en del der ikke modtog april nyhedsbrevet, her er resten af indholdet. Omtalen af Springbank 17 Port kan læses længere oppe i denne tråd. 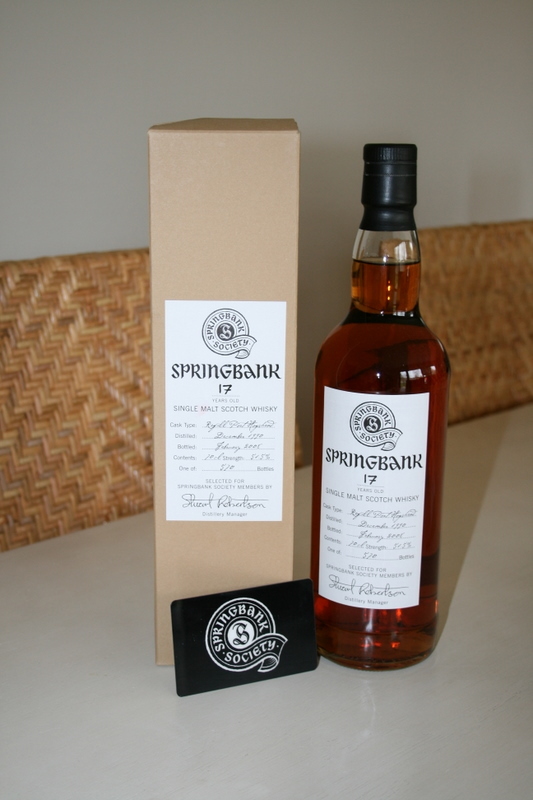 The year 2008 represents a significant milestone in Springbank's history. It was 180 years ago that Springbank Distillery was officially established in 1828 on the previous illicit site of Archibald Mitchell, great-great grandfather of the present Chairman, Mr. Hedley Wright. It was Archibald's sons, John and William who took out a licence and distilled legally as J & W Mitchell.. To mark this very special anniversary, we will be releasing a series of bottles throughout the year which will only be available to Society members. We are unable to reveal more details about these bottles yet but you can be sure they will be very special. As you will all be aware, some weeks ago we sent out membership forms to all our members offering the chance to upgrade to a FREE Lifetime Membership. We have had a very good response and we are very pleased to have so many people who enjoy and are enthusiastic about Springbank and our whiskies. We are currently processing your new membership cards and these will be sent out along with your Society bottle should you choose to order one. If not, your cards will be sent out separately within the next few weeks. If you have any friends or family who want to join the Society, you can tell them that we will be taking new membership applications from the beginning of May. We will only be offering Lifetime Memberships from then and the cost of membership will be a one-off payment of £50. We're also delighted to be able to bring you news of some exciting changes to the website www.springbankwhisky.com . We are currently working with our friends at Intimation Design on a brand new site design and layout which we think you will all like. While there is a lot of work involved in redeveloping the website, we are sure that all the hard work will be worthwhile. Not only will the site be more informative, it will also be easier for visitors to use and navigate and for us here at Springbank to administrate. The online shop will also be changing as part of the revamp and this should make it even easier for our members to order their Springbank whiskies and merchandise. We will also be making some changes to the Society Forum which we hope will encourage more of you to use it on a regular basis. We will bring you more news about the website and the forum when we are closer to going live with the new design. After the success of last year's Whisky School at Springbank, course Rector and Director of Production Frank McHardy has decided to extend the number of terms available this year. We have also moved the term dates to encourage more people to attend. As many of you already know, Springbank is the only distillery in Scotland to carry out the entire production process on one site, making it the ideal place to come and learn the ancient craft of Scotch whisky production. From malting to maturation and production to bottling, the Whisky School offers students the chance to get their hands dirty at Springbank and our experienced staff are looking forward to passing on their knowledge to the students over the course of their week-long terms. There will also be the chance to enjoy a special Springbank tasting and a graduation lunch in The Tasting Room. The Whisky School will be run in June, September and October this year. There are still some places available. If you are interested in attending you can find out more by visiting our website or by sending an email to whiskyschool@springbankwhisky.com . In case any of you missed the announcement, Springbank has declared 2008 to be the Year of Longrow. We have released some very special Longrow bottlings and will be holding special Longrow tastings and masterclasses at events around the world throughout the year. In addition to the standard Longrow bottlings, 2008 has already seen the release of a 7 year old Longrow Gaja Barolo Wood Expression, the new Longrow CV and the Longrow 18 year old. The CV has become part of the standard range of Longrow bottlings but the Gaja Barolo and, in particular the 18 year old, are limited in quantity. All three whiskies have received good reviews from various websites and publications and are great additions to our range of products. Our annual period of production at Mitchell's Glengyle Distillery began this week after the production team spent the first three months of 2008 malting barley at Springbank. When mashing and distilling is finished at Glengyle there will be a short spell in June when we are both malting and distilling together at Springbank, making it the ideal time to take advantage of the free tour you are entitled to as a member of the Society. We will also be carrying out malting and distilling in October this year if you cannot manage to visit us in the summer. If you are coming to visit Springbank this year you can book your tour by email to the Society address or to tours@jandamitchell.com , or you can call the Cadenhead's Whisky Shop on +44 (0) 1586 551710. That's all for now, hopefully all of these new bottlings will keep you entertained until next time! Bjærre wrote: Jeg har heller ikke fået, hverken det rigtige brev eller seneste mail, og det er vel lidt underligt i betragning af, at mailen om ledige pladser på deres whisky skole er nået frem til min mailboks. Jeg kan også stadig logge ind på sociaty siden. Et opkald til Janet idag satte lidt skub i sagen - hun ville dog gerne have verificeret mit medlemsskab ved at jeg tog en fotokopi af mit medlemskort og fax'ede det til hende sammen med adresse og kreditkortnummer når jeg nu skulle have flaske leveret. En mail, med et billede af mit gamle medlemskort, affødte straks et svar med løfte om nu ar være registreret som life time member. Har lige sendt et billede af mit medlemskort afsted, så jeg håber da jeg får samme behandling som dig. Den nye Springbank Society Port Wood er nu på Whiskyauction. Auktionen løber stadig et par uger og den er p.t budt op i 175 €. Nose: Salty, butter, toffee, briny and heather honey. Palate: Nutty marzipan, peanut butter, floral and bubblegum. Finish: Salty with hints of smoke - smoke on the water! Nose: Egg nog, caramel, hazelnut paste, creamy and cut hay. Palate: Soft around the edges, elegant smoke, nutty and cox apples. Finish: Dry finish that tickles your taste buds, really nice with a drop of water in it! Nose: Fruity, cantaloupe melon, tangerines, clementines, shortbread and icing. Palate: Nougat, dark red forrest fruits, nutty, sweet and deliciously oily. Finish: Loooooong finish, hints of peat evident a good honest Kintyre dram. Det har hidtil været lidt omstændigt at få Society flasker hjem fra Skotland. Den gode nyhed er så, at der arbejdes på at medlemmer fremover skal kunne købe flaskerne på på SS hjemmesiden og få varen leveret gennem deres lokale Cadenheads forhandler. Man betaler så ikke skotsk moms og told, men dansk moms og told på lovlig vis. Priserne forventes at komme til at ligge på nogenlunde samme niveau. Hvordan joiner man Springbank Society? Nose- The nose on this is very fruity, citrus fruits such as mandarins are particularly dominant.These initial notes are replaced by aromas of caramel and spices. noticeable and really tickle the taste buds. It is an oily and chewy dram. Last edit: 6 years 1 month ago by Duffer. No pre-orders will be taken. Only email orders from 9th April will be accepted. The purpose of this newsletter is to provide you with information on the forthcoming release and how and when you can order it. You will receive a newsflash on the release day to let you know that you can place an order. Nose : Orchard fruits; fresh juicy green apples and pear skins. Rich and creamy; creme brûlée, hints of toffee and Seville Oranges. Palate : Syrup engulfs the mouth. Honeycomb emerges with milk chocolate, prunes, vanilla sponge cake alongside oak and nut notes. Finish : Raisins and pecan pie develop, followed by liquorice root, coffee bean and blueberries.